There's two reactions you get when your asked to come down and have photos taken in real life, its either "Hell yes, the camera loves me" or "Over my dead lifeless corpse like body". In second life though its different, because the moment angelis bourn sent a message over chat channel for volunteers the reaction was a casual "yeah, of course we'd come down and support... Erm...For whatever it is we're doing". The whatever it was they were doing happened to be a photo shoot for the academy. We didn't ask the what's and whys but all scrambled down there in which ever means was applicable to us. 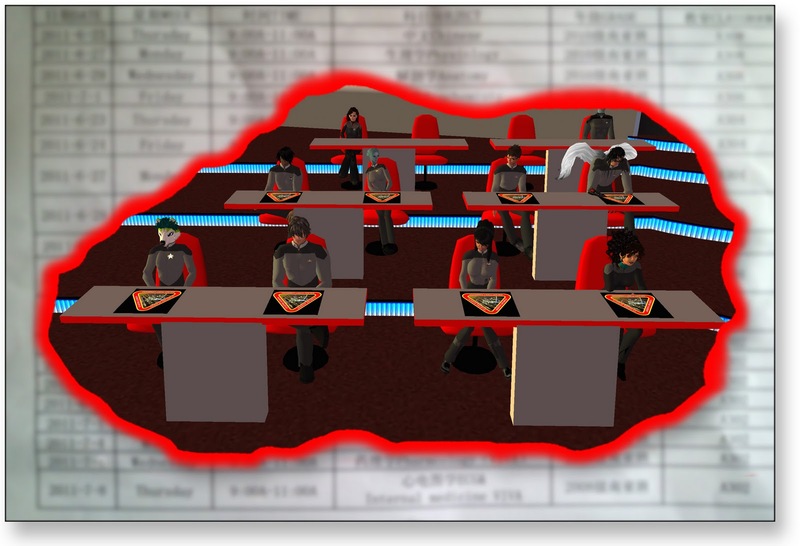 When I arrived the red classroom was already filled with medium to high ranking officers, all decked out in recruits outfit for the shoot. I was as game as any one and was given and outfit. Now, as you know in SL there are many ways to attach a uniform. I chose the most immediate which was to throw the whole directory on to me. There was only one small problem with that....whoever gave me that particular outfit forgot to add trousers....and....lets just say the bottom part of my uniform didn't so much not rezz, it was simply missing leave me standing cold in the wind. I making a swift escape out of the academy doors to a height above the building so I could negotiate a pair of pants. After someone throw me a pair of regulation trousers I was able to return to the shoot, fully dress, slightly embarrassed, but ready to go. Later in the day some of us academy staff where asked to take individual photo's, so expect scary pictures of us scattered around the sim very soon.